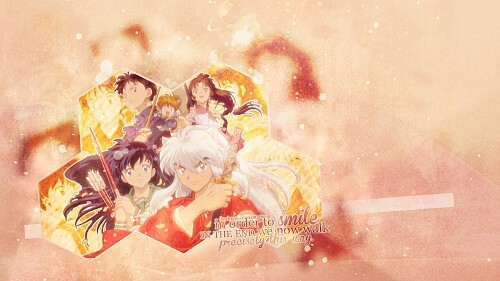 Inuyasha Wallpaper: In Order to Smile. Minitokyo »	Inuyasha Wallpapers » Inuyasha Wallpaper: In Order to Smile. Credits: http://dastardly-icons.deviantart.com/, http://rodiennes.deviantart.com/, http://violetspell.com/, http://colourlovers.com/, and http://dafont.com/. Wow! To think this anime is quite old and yet someone still makes a wallpaper out of it. This is really awesome. InuYasha will forever be my most favorite anime. If not because of it, I won't be watching and loving anime. Great job for this wallpaper. It gives a nostalgia of my childhood.Thank you very much for this. Quote by Blue-CrescentWow! To think this anime is quite old and yet someone still makes a wallpaper out of it. This is really awesome. InuYasha will forever be my most favorite anime. If not because of it, I won't be watching and loving anime.